Iris, you are preaching to the choir! I will add one thing to the list- great hair- and you will always look fabulous. I love Iris Apfel for her unique, over the top and irreverent style. 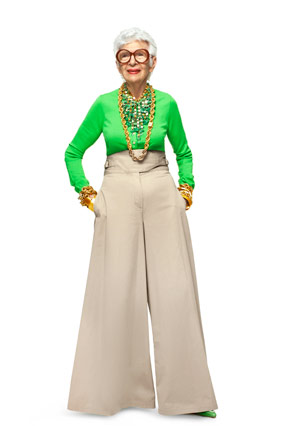 She is a one-of-a-kind, 91 year old it girl! Check out some of my favorite images of her below. Coco Chanel may have advised us to look in the mirror before you leave and take one thing off. That may be true in most cases but Iris Apfel gets excess just right. To me, her individuality is what makes her beautiful.